*We had enough info to go back 5 months with the Google Adwords account to pull info. However, how we tracked leads and the lead status changed in July and is why Lead Quality metrics only go back until July. As you can see, the number of leads drastically drops in September, but the lead acceptance rate starts increasing. In the 3rd quarter of 2014 there was a total of 55 accepted leads with a total of 243 leads (22.63% acceptance rate), while in quarter 4 there were 58 accepted leads with only 101 leads (55.28% acceptance rate). Overall, this led to an increase of 144.28% in lead quality while saving $8309.56 on ad spend, and EZTrackIt was still able to see an increase in the amount of accepted leads. Before we established any new strategies we needed to know which types of potential leads to focus on for the new content. By working with EZTrackIt’s CEO and sales team, we created a list of buyer personas - descriptions of target clients we use to direct marketing efforts. From there, we also created a list of keywords to start building out the content calendar. After reviewing their Google Adwords account, we noticed there were many generic keywords listed, which lead to excessive spending and low quality lead generation. After reworking the ad campaign in August, EZTrackIt’s total spend over the next 5 months (August - December) was $889.24 compared to the previous 5 months (February - July) at $9,198.80. This change catalyzed the beginning of the lead quality shift. However, we still needed to keep a close eye on the number of quality leads being generated since there was a drop in ad spend. After mapping out EZTrackIt’s buyer personas and discovering the best keywords to direct our content marketing efforts, we began to build new landing pages for specific targeted audiences. Then we mapped any current campaigns or ads to the new landing pages, giving us a great start on filtering out the lower quality leads. In the next 6 months, we will concentrate on the top and middle of the sales funnel, nurturing leads towards “Try it Free” and “Request a Demo” CTAs so the EZTrackIt sales team can close more deals with informed, warm leads. However, we don’t just want to increase the number of leads converted, we also want to focus on attracting the highest value leads. 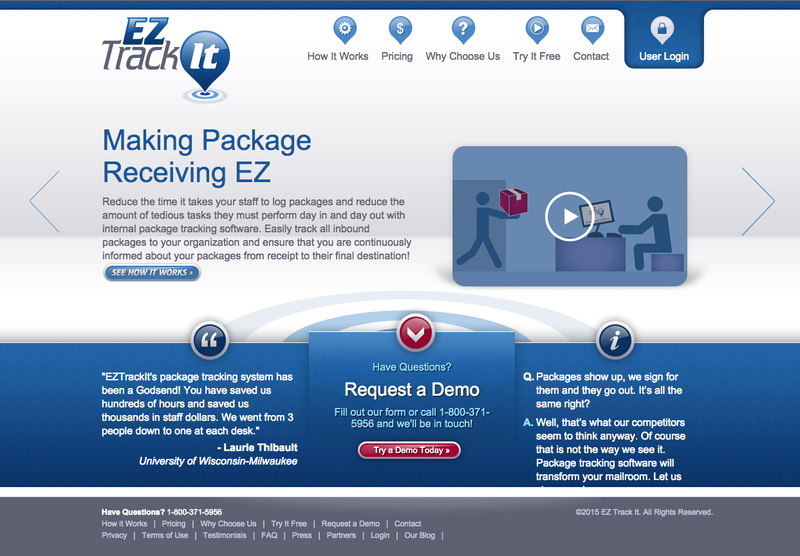 With that in mind, we’re directing our content strategy to target high-value industries for which EZTrackIt is a strong solution to their package tracking needs. Additionally we are working on a product rebrand with a new product with advanced feature sets launching. We will update this post following the completion of the new product design and the results of the new website on lead generation. Do you have a product you would like us to review and see what opportunities may be overlooked? Let's have a brief 30 minute call with our free business assessment.